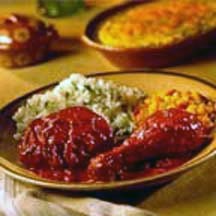 CooksRecipes has quality, kitchen-tested recipes for Mexican dishes that you can count on for successful deliciousness. 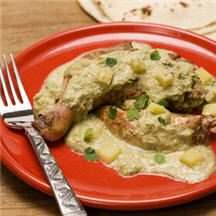 Tender pieces of chicken and potatoes served in a delicious cream sauce seasoned with tomatillos and poblano chiles. 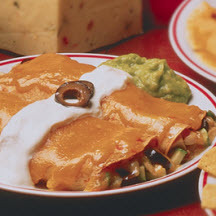 These cheesy chicken enchiladas are filled with pepper Jack cheese, tomato slices, grated zucchini and olives, and topped with a generous amount of Colby cheese. Legend says that Molé was created by the nuns of a Mexican convent for a visit by the Spanish Viceroy.